The Saitek Mephisto Maestro Travel Chess Computer lets you improve your game as you play chess against the computer. It combines modern styling with a compact design and a one of a kind, blue backlit touch screen packaged into one potent computer chess game. This advanced Chess playing powerhouse offers an extended range of strengths that will challenge the wits of even the most advanced players. Some of its programming features include: 100 Playing levels, including 60 fun and 40 Competition; Hints Tips and Coach Mode; and 64 Study Positions that let you see how the experts do it. You can experiment and learn by using the take back function to replay over 200 moves. A Setup Option built-in to the Saitek maestro travel chess computer lets you try out new positions and moves. This computer chess game has an estimated Play Rating 1600 at 40 moves in 2 hours. The sophisticated control panel tells whose turn it is, and has a built-in clock. 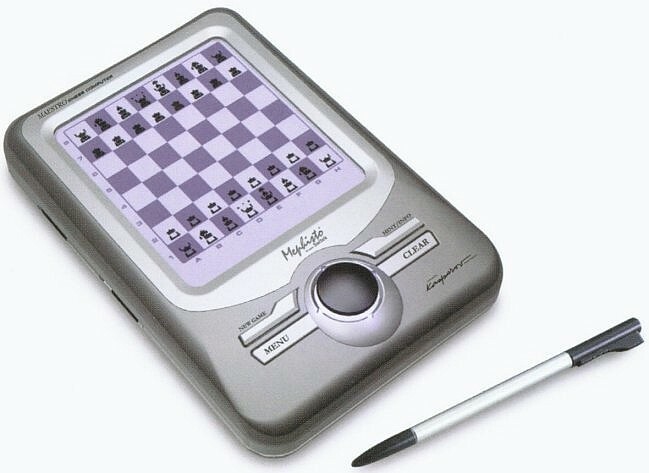 This Maestro chess computer includes a Self Rating System, and supports special chess moves such as En passant, Castling and Pawn pormotion. It even saves all your unfinished games in memory. All Saitek Mephisto model Chess Computers are endorsed and tested by the Chess champion of the world, Garry Kasparov. Uses 3 AAA batteries (not included). Its dimensions are 5" x 3 1/4" x 3/4", and includes a protective cover.